In each case, the top stave gives the harmonic series of the string up to the 19th partial. 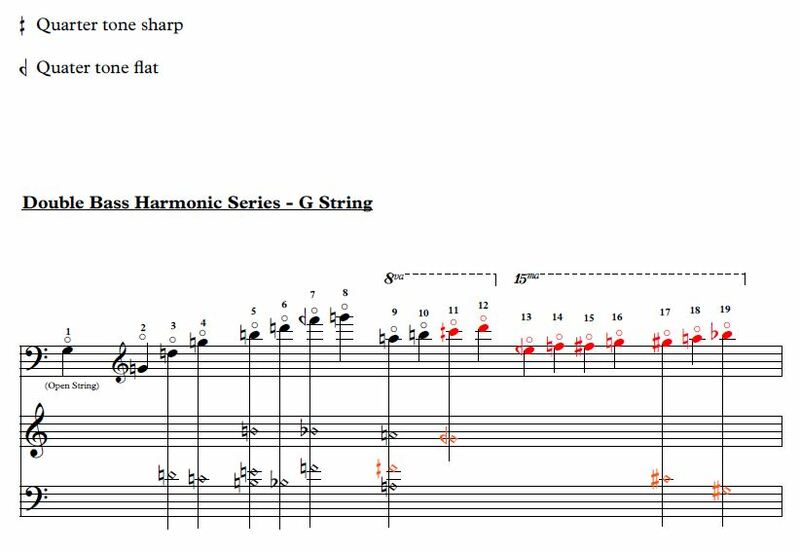 The lower staves denote the relative node points for each harmonic on the same string. Red pitches signify that they are impractical to play in the specified register. Orange pitches signify unreliable node points. Below are the tables of harmonics for four stringed instruments equipped with a C-Extension or five stringed instruments with a low B String. Below are given charts for the 12-16th and 18th partials. Due to thier proximity to eachother, accurate reproduction of these partials is unrealistic. However, they can be found by microtonally fluctuating around the given node points.